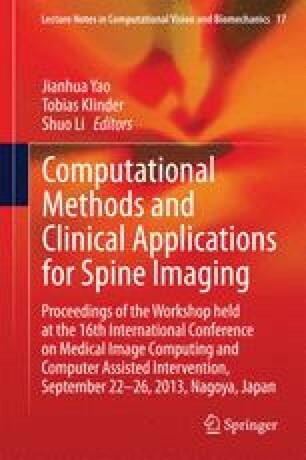 Accurate segmentation of spinal canals in Computed Tomography (CT) images is an important task in many related studies. In this paper, we propose an automatic segmentation method and apply it to our highly challenging 110 datasets from the CT channel of PET-CT scans. We adapt the interactive random-walks (RW) segmentation algorithm to be fully automatic which is initialized with robust voxelwise classification using Haar features and probabilistic boosting tree. One-shot RW is able to estimate yet imperfect segmentation. We then refine the topology of the segmented spinal canal leading to improved seeds or boundary conditions of RW. Therefore, by iteratively optimizing the spinal canal topology and running RW segmentation, satisfactory segmentation results can be acquired within only a few iterations. Our experiments validate the capability of the proposed method with promising segmentation performance, even though the resolution and the contrast of our datasets are low.